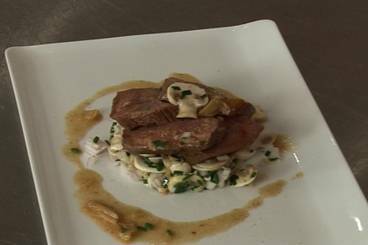 Slices of pan fried duck breast served with mushrooms marinated in olive oil and lemon served with a garlic butter sauce. Juice the lemon. Finely chop the chives. Peel and finely chop the shallots. Peel the mushrooms and finely slice. Add the chopped shallot to the mushrooms then season with salt, pepper, lemon juice and olive oil. Prepare your duck breast by removing any sinews and trimming away any excess fat. Score the skin in a diamond shaped pattern making sure to not cut into the flesh. Season with salt and pepper. Heat a frying pan to hot and sear the duck breasts skin-side down for 5 minutes, draining off any excess fat. Add a knob of butter and the unpeeled garlic cloves then turn the duck fillets and cook for a further 4-5 minutes. Remove the duck from the pan and allow to rest. Remove the skin from the cooked garlic and chop finely. Wipe any grease from the pan then deglaze with two tablespoons of water. Add another knob of butter and the two cooked and crushed garlic cloves. Whisk to create a very quick sauce and finish with the chopped chives. To serve: thinly slice the duck breasts. Spoon the mushrooms into stainless steel serving rings and press down gently. Remove the serving rings and place the sliced duck breast on top. Finish with the garlic butter sauce.